The flag of Jersey City has three equal vertical stripes of blue, white, and yellow, with the city's seal set slightly above center on the white stripe. The seal has a gold field edged in brown, and bears a shield divided in half horizontally, white over light brown. In the top center of the shield is a large sailing ship, brown with gold sails mostly furled, as if at anchor, its prow facing the fly. To the hoist side of the ship, on the landed horizon, is a brown steam locomotive and coal tender, smoke chugging from its smokestack toward the fly. On the fly side of the ship, also on the horizon, is a historic city skyline in white with black shadings and prominent church steeples. A white seagull floats over the ship's stern. In the lower half of the shield, on the upper hoist side, is a small white sailboat. In the lower center is a two-masted ocean steamer with brown smokestacks and yellow smoke billowing from them, coming into dock at a burnt-sienna-colored wharf that slants across the bottom hoist portion of the shield. Above the shield is a brown-edged gold scroll with an inscription, LET JERSEY PROSPER, in brown letters. 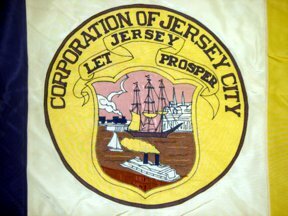 Surrounding the shield is a brown-edged gold ring with CORPORATION OF JERSEY CITY curving clockwise over the top, in brown. William J. McGovern, director of parks and public property, asked that Mr. Hugh Clarke design the flag. Adopted 19 July 1938 (official). Hugh "Buz" Clarke, a city engineer. The flag was adopted by a city resolution introduced by William J. McGovern, city commissioner. 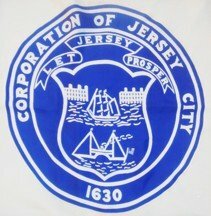 The original resolution states that the official seal of the City of Jersey City be included and affixed to the white on this flag, with the numerals 1630 placed below the seal. This original seal was not enclosed in a circle as it is today, but was just the heraldic ribbon and shield. Moreover, as is frequently the case in rendering of city seals by different artists over the years, the elements of the seal are pictured differently. The field of the shield is not divided by colors, although we do not know what the original colors may have been, if any. 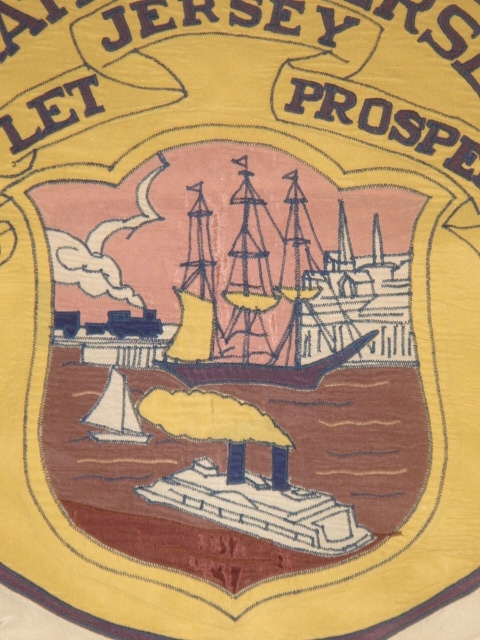 No locomotive appears on this shield, just primitive buildings on either side of the sailing ship, and the steamboat is under way toward the lower hoist corner, no wharf in sight. The date, 1630, does appear at the lower center on the city's seal today in a circular band around the edge, but has not been carried over to the current flag. I was fortunate to win the eBay auction for the - as they called it - "marching band flag". Attached is a variant of the Jersey City seal - not just the simpler color scheme, but also the items depicted.